First Business Meeting Agenda, Friday July 16, 2004, 2 p.m.
Roundtable Discussion – moderated by Gary Reid (WA) official vs unofficial publications, official without paper, digital signatures. Friday, July 16, 2004, 3:00 p.m.
Conservation of Rule Documents – Sandra Jaramillo (NM), Saturday, July 17, 2004, 9 a.m.
Joint Meeting – 100th Anniversary Opening Ceremony, Saturday, July 17, 2004, 10 a.m.
NASS Emeritus Members Roundtable – Defining Moments for NASS, Saturday, July 17, 2004, 11 a.m. 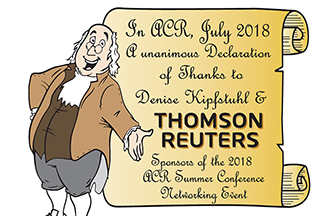 Follow Up on Missouri Rule System – Lynne Angle & Jim McClure (MO), Saturday, July 17, 2004, 2 p.m.
Roundtable Discussion – Moderated by Dan Procter (TX), ensuring rule integrity, proofing methods, e-mail delivery issues, Saturday, July 17, 2004, 3:15 p.m.
Colborn Award – Presentation and Demonstration, Sunday July 18, 2004, 9 a.m.
Rule Writing Update – Sherri Kovach & Beverly Barr (ID), Sunday July 18, 2004, 10 a.m.
Pennsylvania Regulatory Review Procedure – Mary Wyatte (PA), Sunday July 18, 2004, 1 p.m.
Revising the Model State Administrative Procedure Act – Professor John Gedid (NCCUSL), Sunday July 18, 2004, 2:15 p.m.
Louisiana Rulemaking – Monday, July 19, 2004, 9 a.m.
E-Forms – Paul Wernet (Formatta Corporation), Monday, July 19, 2004, 11 a.m.
E-rulemaking – Susan Volotta (CCH, Inc.) & Friends, Monday, July 19, 2004, 2 p.m. Photos of this conference can be submitted for posting. Please contact the Webmaster. A special thanks to John Martinez, New Mexico for electronically archiving this conference!